Limited edition, handmade book of photography. More information. My second limited edition, handmade book of London street photography. You can see all the pictures, here. Sold out - my first limited edition, handmade book of London street photography from December 2001. You can see all the pictures, here. Recommended Books and links on Photoshop. 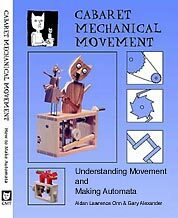 This is a book about basic mechanisms and making automata, mechanical toys & sculpture that I designed and co-authored. It has sold over 6,000 copies and is very popular in Design & Technology departments in schools, as well as with individuals who have the urge to make things move. The book is published by Cabaret Mechanical Theatre and you can buy it at their secure online shop - they are very efficient and ship all over the world. Coming soon! This video follows the construction of a bronze sculpture by Allan Sly for the P&O liner, Aurora. 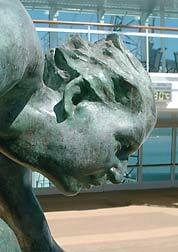 It shows the process from welding the armature, through clay modelling to casting in bronze. Click on more information to find out more, see a little of the video, and register for e-mail notification when the video is available. This video follows Paul Spooner as he attempts to build a new machine in one day stopping only to feed his chickens (more or less). 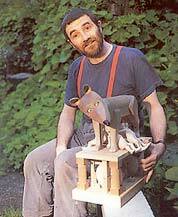 Paul Spooner is probably the greatest maker of contemporary automata and much of his work is featured on this tape. It shows in some detail how difficult the automata maker's art can be and illustrates how even the great can make mistakes... regularly. Running time is approximately 35 minutes. Available in PAL and NTSC DVD. Making automata is hard. It requires a wide range of construction skills and an understanding of certain mechanical and engineering principles. 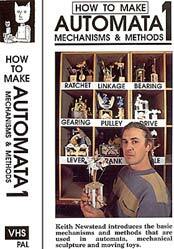 This can be very frustrating for the beginner but help is here now with this inspiring video featuring Keith Newstead, on of the UK's foremost automata makers. Running time is approximately 45 minutes. Available in PAL and NTSC DVD. This is a video catalogue of the Cabaret Mechanical Theatre collection of contemporary automata. See the mechanisms in detail and meet some of the makers in their workshops. This DVD features over 30 different machines - a feast of the weird and the wonderful.